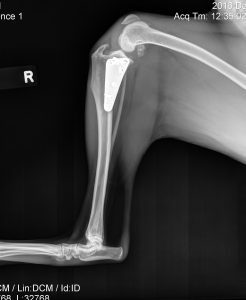 Charlie is a young Golden Retriever and has undergone multiple orthopedic surgeries in an attempt to manage a right ruptured cranial cruciate ligament (CrCL) and right lateral luxating patella. Charlie also has moderate left-sided hip dysplasia and a total hip replacement has been recommended for the future by his orthopedic surgeon. Charlie has compensatory muscle strains in his lower back and left pelvic limb from chronic right-sided pelvic limb lameness. Acupuncture was added to his management plan in order to provide pain relief and relieve muscular strains and facilitate return to function. After three acupuncture sessions, Charlie appeared more comfortable and was less sensitive to palpation of previously taut bands. Charlie is a three-year-old male neutered Golden Retriever. He was adopted as a two-month-old puppy and had no significant medical problems until May of 2016. At that time, Charlie’s owner noticed that he was non-weight bearing on his right pelvic limb after running around in the backyard. The following day, a physical exam and radiographs performed at his regular veterinarian confirmed a right CrCL tear. Charlie was started on metacam and tramadol and a tibial plateau leveling osteotomy (TPLO) was scheduled for July 8, 2016. Following his surgery, Charlie did very well for a few months. Then, he started favoring his right pelvic limb again. 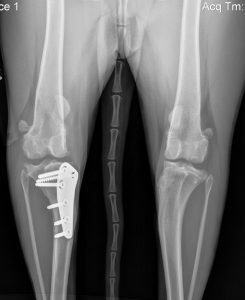 Radiographs revealed no obvious changes: his plate and screws were in place and the osteotomy appeared to have healed well. As Charlie continued to worsen with his right pelvic limb lameness, another surgery was scheduled for January 2017. At that time, Charlie’s surgeon found a torn meniscus and a lateral luxating patella, which were surgically corrected. The plate and screws from the TPLO were removed due to concern for infection. Following his second surgery, Charlie again appeared to be doing well, with no obvious lameness. In May 2017, Charlie went for a walk on the beach after which he began favoring the right pelvic limb again. Consequently, Charlie was seen by a specialist surgeon who recommended a patella alta surgery as his patella appeared to be placed incorrectly. Charlie had his internal sutures removed in July 2017 in order to prepare him for yet another surgery. Since Charlie’s owner soon moved, she decided to get a second opinion from another surgical specialist. It was recommended that a second TPLO surgery would be best for Charlie. The second TPLO was performed in December 2017. He has been recovering for the last 2 weeks and is fully weight-bearing on his right pelvic limb. In addition to his right stifle problems, Charlie also has moderate left hip dysplasia and a total hip replacement has been recommended by his surgeon. After each surgery, Charlie was prescribed metacam and tramadol for a few weeks post-operatively. Charlie has been receiving monthly Adequan injections since January 2017, and he recently started taking gabapentin regularly to improve his overall comfort levels. I first met Charlie at the end of October 2017, prior to his second TPLO surgery. Our goals for Charlie were to improve his compensatory muscle strains and relieve pain without the use of additional pain medications. Given that Charlie is only three years old, we are aiming for longterm and sustainable improvements to his quality of life. Physical exam findings are from October 2017, prior to Charlie’s second TPLO: Charlie’s general physical exam is within normal limits, apart from his musculoskeletal exam and myofascial palpation. He has grade 2/4 right pelvic limb lameness with genu varum and severe muscular atrophy. 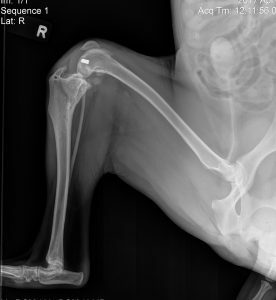 There is grade 2/4 lateral patellar luxation, significant medial buttress and positive cranial drawer of right stifle. He has severe pain and restricted range of motion on left hip extension; left stifle palpates normally. Normal postural reactions and spinal reflexes. Taut bands, exaggerated panniculus reflex with paraspinal hyperesthesia and tenderness to palpation at level of thoracic vertebrae 13 to lumbar vertebrae 2 (T13-L2), as well as sacral spinal palpation. Taut right quadriceps and left hamstrings. 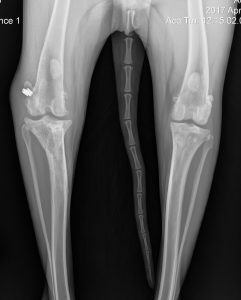 Radiographic findings reviewed from December 2016, January 2017, April 2017, and July 2017 include marked osteoarthritic changes in the right stifle and moderate left hip dysplasia. Radiographic views did not include spinal radiographs. Complete blood count and serum biochemistry (most recent performed 11/28/17) were within normal limits. Due to multiple surgeries of the right stifle, Charlie has developed compensatory muscle strains of his thoracolumbar (TL) and sacral spine, right quadriceps and left hamstrings, as well as right pelvic limb muscular atrophy. Our acupuncture approach aims to relieve TL and sacral muscle tension in order to reduce pain, decrease sympathetic tone, reduce muscle shortening (releasing trigger points) and reduce wind-up. Our goals with Charlie are to increase his quality of life by improving mobility and range of motion, reducing his reliance on medications, and increase comfort levels. Acupuncture points included homeostatic points to modulate inflammation and analgesia (including GV20, GV14, GV4, Bai Hui, ST36), spinal segment points (bladder line points), points proximal and distal to the site of injury, as well as local stifle points, and hip triad points. Charlie’s owner was educated on at-home massage techniques to further reduce muscle spasm and inflammation, improve circulation, comfort level and facilitate myofascial release. Each acupuncture session lasted about 15-20 minutes and was performed on a weekly basis for 3 weeks. Severe left coxofemoral osteoarthritis, severe right tibial varus deformity with external rotation, ruptured right cranial cruciate ligament, grade 2 lateral patellar luxation right side. Post-operative pain secondary to multiple right pelvic limb surgeries, including nociceptive pain secondary to disuse and stress during each post-operative recovery period. Charlie is a sweet and friendly patient and was very receptive to his acupuncture treatments. Dry needling was performed for all acupuncture sessions, as an electroacupuncture unit was not yet available at the time of treatment. Laser therapy was also not initiated at this time due to lack of availability. Points were chosen for autonomic nervous system input, central nervous system input, anti-inflammatory effects, and to release local trigger points. For Charlie’s first treatment, a smaller number of points was selected in order to gauge his response to acupuncture, and to create a positive and relaxing experience. Bladder line points were chosen to release local pain and tension, especially along Charlie’s thoracolumbar region. GV20, GV14 and Bai Hui were used for autonomic nervous system input. During his subsequent sessions, more points were included as Charlie tolerated the sessions extremely well. In addition to the aforementioned points, hip triad points (GB29, GB30 and BL54) were included for local tender hip points. KD3/BL60 was included for general spinal and pelvic limb pain. Stomach, spleen and gallbladder points near the stifle (ST36, ST35, GB33, SP9) were used as local points to address stifle pain. Regular massage of Charlie’s lower back was recommended at home, especially as he seemed to enjoy this technique very much. After each acupuncture session, Charlie appeared more agile and wanted to move around more at home. His overall comfort level appeared much improved. Charlie had a few setbacks during times he increased his activity levels beyond the recommendations, such as after a day at the beach and a weekend of lots of stair climbing. Clinically, Charlie’s myofascial exams improved after each treatment. After Charlie’s most recent surgery (December 2017), it was recommended for him to consult with a local rehabilitation clinic in order to continue to improve his right pelvic limb weakness and muscle atrophy. Hopefully, Charlie’s most recent right pelvic limb surgery was his last and non-surgical methods can be used to improve chronic pain and weakness.